We Carry a Variety of Wholesale Housewares Liquidation Lots. Please review the listings below for further details. 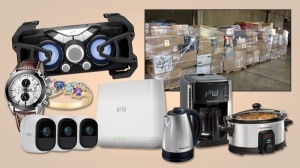 Loads typically include: Pressure Cookers, Air Fryers, Toasters, Knife Sets, Grills, Cookware Sets, Fans, Heaters, Vacuums, Blenders, Irons, Microwaves, Coffee Makers, TV’s, Video Game Consoles, Headphones, Speakers, Radios, Bluetooth Devices, Chairs, Stools and more. 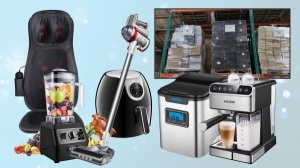 Featured brands typically include: Xbox, Samsung, Sony, Bionaire, Mr. Coffee, Oster, Bella, Food Network, Nintendo, JBL, KitchenAid, Foodsaver, Copper Chef, Crock-Pot, Cuisinart, Hamilton Beach, Keurig, Ninja, Rachel Ray, Corelle, Canon, LG and more. Assorted Customer Return Kitchen, Houseware & Personal care items. Manifested & sold as a % of Wholesale Value. Missing minor or major components. One or more features does not work. Brands typically found: Kitchen Trend, Lifetime Hoan, Fagor America, Spectrum Brands Inc, Shaper Image, M Block & Sons, Martha Stewart, Braun, Hoover, Dyson, Wolfgang Puck, Sunbeam, Delonghi, E. Mishan & Sons, OXO International, Chantal Cookware, Le Cook's Ware, Tools Of The Trade, World Kitchen and more! Loads typically contain: cutlery storage sets, stainless roasters, bakeware, cookware, cake decorating kits, dinnerware, pots & pans, ceramic items, meat thermometers, salad spinners, storage containers, pot clips, apron timers, knife sets, panini machines, coffee makers, juicers, griddles, hot air operas, deep fryers, doughnut makers, buffet servers, juice extractors, popcorn makers, rotating wafers, blenders, quesadilla makers, waffle makers, crock pots, slow cookers, rice cookers, steam mops, hand vacuums, shavers, massagers, steamers, convection ovens, toaster ovens, titanium groomers, mortar & pestle sets and more! New Overstock Loads from ARW Department Store. Majority of ARW Overstock Loads are either predominantly made up of Furniture or Apparel. Other Categories which are at times available are Domestics, Housewares, Shoes & General Merchandise. Majority of ARW Overstock Loads are either predominantly made up of Furniture or Apparel. Other Categories which are at times available are Domestics, Housewares, Shoes & General Merchandise. At times loads may have a large quantity of one item or a handful of items. At other times loads can be very assorted. Please review available Loads to see details of current availability. Please review sample images to get a better understanding of what to expect. Please see individual manifests for the specific contents, values & price of each available load. Assorted Polo Ralph Lauren Customer Return Non Clothing Loads. Manifested & sold as a % of Wholesale. 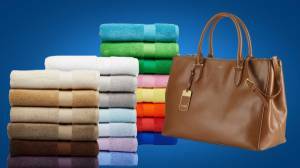 Loads typically contain: Polo Ralph Lauren Branded Bedding, Bath, Towels, Fashion Accessories, Handbags, Wallets & More. Loads typically include: Small Appliances, Lighting, Luggage, Cookware, Dinnerware, Floor Care, Home Décor, Seasonal Gifts, Jewelry Boxes, Window Hardware, Cutlery, Flatware, Personal Care, Home Décor, Food Preparation, Accent Furniture, Pet Care, Baby Items and more. 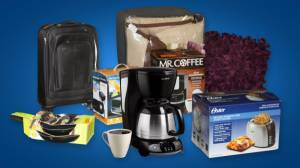 Featured brands typically include: Kitchen Aid, Keurig, Ninja, Power Air Fryer, NuWave, Cuisinart, Hamilton Beach, Oster, Bunn, Faberware, Calphalon, T-Fal, Corelle, Gibson, Samsonite, American Tourister, Xbox, Dyson, Shark, Rachel Ray and more. WM Store Customer Return Microwaves from the largest US retailer. Pallets are unmanifested and sold at a flat price per piece. 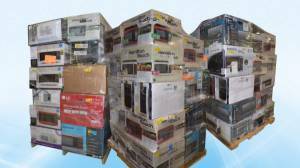 Pallets include an assortment of Microwaves both in box and out of box with the majority typically in box. Pallets are predominantly made up of customer returns so you should expect a % of defects. 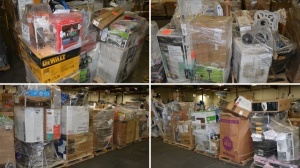 Pallets typically include brands such as: Hamilton Beach, Samsung, Oster, Mainstays, LG, Rival, Sharp and more. Pallets typically include sizes such as: 0.7 cu. ft. - 2.0 cu. ft. with the majority typically around 0.9 cu. ft. - 1.1 cu. ft.
Great for discount retailers and flea market vendors. Not ideal or recommended for B2C online sales due to the average weight. See images to get a better idea of what to expect. Loads can typically include: Building Supplies, Kitchen, Lawn & Garden, Hardware, Home Décor & Furniture, Lighting & Ceiling Fans, Outdoor Living, Smart Home & Security Systems, Tools & More. Brands Typically Found: Stanley, Black & Decker, DeWalt, Honeywell, John Deere, Rubbermaid and more brands found at LWS Home Improvement Store. Please see images to get a better idea of what to expect. Liquidation direct from large fulfillment company who handles the customer returns from largest online marketplace for a variety of manufacturers. Loads are manifested by the pallet. 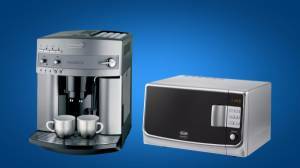 The majority of the goods will be home appliances such as: robot vacuum cleaners, juicers, espresso machines, coffee makers, steamers, meat grinders, bread makers, air fryers, milk frothers, portable ice makers, humidifiers, food processors, and more! Please review the manifest for details on each load. Pictures are only representative of what you will receive. Listed at 18% of Retail. Great products for Discount Retailers, Swap Meets, Pallet Wholesalers, and Export!